The peaceful co-existence between commodity-related investments and most sectors which comprise the broader US Stock indices, is drawing to a close. As inflation tightens its grip over the world economy, US treasuries and stocks (consumer-related, tech, and financials) will suffer while investments in tangible assets will see their gains accelerate higher. I consider the terms "inflation" and "currency debasement" to be largely synonymous. The bottom line is that purchasing power is going to drastically decline. Income and wealth is not going to keep up with rising prices for goods and services for the US consumer. Hard asset investments will emerge as the sole safe haven against the deleterious effects of inflation. I find it amazing that the majority of pundits and advisors in the financial media are still peddling tech and financial investments. Most of these guys who proclaim commodities are in a bubble are merely trying to persuade their audience to invest in US stocks. "A bet against the American consumer has been a bad bet for 25 years" is a popular refrain. Well, 25 years of living beyond our means to consume is going to have ugly consequences. The government's highly inflationary and currency-devaluing policies heretofore created asset bubbles, the over-flow of which created a wealth effect that positively impacted consumption and GDP. The problem was that the numbers masked the rot which was occurring in the real economy. Incentives created asset growth and dependency at the expense of investment in this country's productive capacity in tangible goods. Austrian economists refer to this as mal-investment. Inflation is the inevitable outcome, even in a US-centric world. But things have changed. We are on the brink of massive global inflation, the likes of which the world has never seen. In the recent edition of The Economist magazine an article titled "Inflation's Back" observes, "Loose money in American and rigid exchange rates in emerging markets are a perilous mix." Now that this bubble has burst, the cross-border monetary stimulus has changed direction. As the Fed has cut interest rates, emerging economies that link their currencies to the dollar have been forced to run a looser monetary policy, even though their economies are overheating. Emerging economies with currencies most closely aligned to the dollar, notably in Asia and the Gulf, have seen the biggest price rises. While the majority of Americans are waking up to inflation they do not fully comprehend its global nature and effect on commodity prices. They have yet to be converted to the bullish case for commodities. On the other hand, pension funds, endowments, sovereign wealth funds, and other institutional funds are converting and Congress is not pleased. We are not a bubble. We are in the second phase of a multi-year commodity rally that began six or seven years ago. The first phase was marked by the early smart money trickling in. The second phase began in earnest last year when institutional money started to pour into passive index funds. The third phase is yet to occur and will be made obvious when thousands of mutual funds and other investment vehicles are created, and the individual investor, after finally losing faith in his tech and consumer stocks, capitulates and converts over to the commodity world. Or will it? If Congress has its way, investments in commodities might be limited. Failures to scapegoat President Bush, OPEC, and the energy companies (though they still valiantly try) have forced them to point their cross-hairs on a new group of investors. They use the pejorative term "speculator" when describing this evil cohort. This is ridiculous and confirms that they either have no idea or interest in exploring the real causes of our current predicament. Any attempt to devise solutions without understanding the cause of problem is the height of ignorance and could have devastating consequences. Investors/speculators are moving into hard asset investments to protect themselves from the effects of the government's harmful inflationary policies. The policies of our government have left us up a creek and not having the means to preserve our wealth by investing in non-paper assets would indeed take away our only paddle. Are they trying to force us to continue to throw good money after bad by investing in financial stocks, US treasury paper, and other US stocks? Inflation visibly rearing its ugly head in plain view for even the most near-sighted Keynesian economist to see, despite the laughable grossly-distorted US government statistics, is quickly morphing into runaway freight train, threatening to destroy your purchasing power and value of your paper assets. As long as bonds and the US stock market (along with the housing market) were moving higher, the dramatic gains in commodity prices and related investments was tolerable. But now, we are beginning to witness flows out of US paper and into tangible assets. Commodity investments, after five years of moving higher in tandem with the stock market, have resumed their more traditional inverse correlation. We are increasingly witnessing more days when commodity investments and the broader market move in opposite directions. Alarmingly, this might seem to be a positive development in the short run, if the US dollar extends its counter-trend rally to benefit of US paper and to the detriment of oil, grains, and other raw materials. This phenomenon would undoubtedly be short-lived and especially painful for those holding the false hope that it represents a major trend reversal. The seeds of inflation have been sown over the last couple of decades. The next leg of commodity rally is likely to be final mania phase. It will dwarf what we have experienced thus far. If you have missed the first couple of phases of the rally you will be granted the gift of still being able to invest in the most explosive phase. This is troubling to policy makers for two reasons. As money rotates out of bonds and the US stock market and into commodities, not only does it reduce the wealth of those holding the former group, but it also increases the price of the commodity or raw material passed onto consumers. Talk about a double whammy! It further feeds inflation at a time when consumers have less wealth to rely upon and lower relative incomes in stagnant economy. Instead of "Buy, Buy bonds...it's Bye, Bye bonds!" Silly government efforts to suppress commodity investments and to limit free market pricing in any way will not save them from their errant decisions. They are now doomed to the consequences of past inflationary policies. With global headline inflation now at 7% there is a need for new global investment solutions, a role that PIMCO is more than willing (and able) to provide. In this role we would suggest: 1) Treasury bonds are obviously not to be favored because of their negative (unreal) real yields. 2) U.S. TIPS, while affording headline CPI protection, risk the delusion of an artificially low inflation number as well. 3) On the other hand, commodity-based assets as well as foreign equities whose P/Es are better grounded with local CPI and nominal bond yield comparisons should be excellent candidates. 4) These assets should in turn be denominated in currencies that demonstrate authentic real growth and inflation rates, that while high, at least are credible. 5) Developing, BRIC-like economies are obvious choices for investment dollars. This is astonishing. Here you have the world's leading bond investor recommending to avoid US treasuries and US Tips, and to seek out investments in commodity-based assets and emerging markets as an alternative. There could hardly be a greater wake up call for those have yet to convert their investments to commodities. The phrase "You can lead horse to water..." seems to apply here. Now I do take partial exception with his recommendation to invest in the BRICs and other developing markets. I have received some emails regarding my thoughts on emerging market investments. I have participated in this group's advance since I read the Goldman Sachs BRIC report in October 2003. I have recently, however, been gradually paring back my investments in this group, and currently have only minimal BRIC (and other emerging market) investments. If I had to pick among the BRICs I would favor Brazil and Russia over China and India because they are more heavily-weighted in energy and other commodities. But they also contain significant exposure to their consumer, banking, and telecom sectors. I prefer owning only commodities. Why dilute your investments with other under-performing sectors. This approach is consistent with my view that we are close to the final mania phase of the commodity rally. I believe that after the world endures a significant corrective recession after in the early part of the next decade, you will want to make your holdings in the BRIC countries among the largest weightings in your portfolio. For now, stick with commodities. As such, we have no reason to expect that the inflation outcome over the next few years to be much different to the outcome in the 1970s. Such conditions are difficult for investors. History shows that positive real returns can only be secured at the price of much higher volatility, with just a handful of asset classes - commodities, related equity sectors and property - delivering positive real returns. Broad equity investments, cash and particularly bonds lose their value in real terms. Meanwhile, outside the financial markets, macroeconomic volatility is likely to rise and stagflationary interludes proliferate. Life won't be easy in the "nasty" decade. 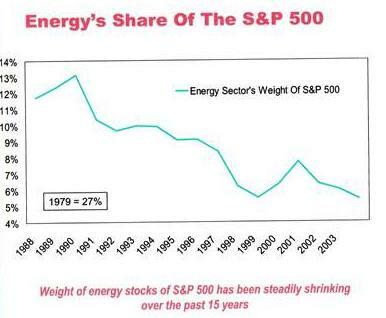 It was clear that oil stocks were bottoming (at the very least in terms of relative performance) and that the potential gains were enormous. People are starting to pay a little more attention to Fatih Birol and he has recently been quoted in several news stories. Birol is leading the IEA in its effort to assess the current energy supply situation in a report which is due in November. According to the Lehman energy analyst, "This is very important because the IEA is treated as the world's only serious independent guardian of energy data and forecasts." Birol, in the middle of his comprehensive study of the world's top 400 oil fields, has tipped his hand: "The prices are very high and demand did not respond in the last few years as much as one would have expected. The growth in terms of production was not great....The oil investments required may be much, much higher than people assume. This is a dangerous situation." As far as the use of coal is concerned, Birol contends that, as the fastest-growing source of energy, coal will remain a "backbone" of global power generation, bolstered by expanding demand in developing nations, According to an article in the Calgary Herald , he told a coal conference hosted in France that "Coal will remain the backbone of our energy system. Efforts by the EU to curb emissions blamed for global warming may be weakened by the expansion of power generation in nations such as China and India." In addition to coal and other energy investments, this final phase will produce a different set of winners than we saw in the earlier phases of this multi-year commodity rally. One analyst, recently recognized in The Wall Street Journal's "Best on the Street List," sagely wrote "at this stage, we are more interested in second derivative companies." Not only are we likely to see a monumental investment rotation into commodities, but are likely on the cusp of big sector rotation within the commodity complex. I have recently been giving away some "free milk" in the form of trades in groups that worked during the early stages of the commodity rally (and still have some gas in the tank) in the "Trader's Talk" section at Green Faucet. I am afraid from now you are going to have to buy the cow if you are interested in learning more about these "second derivative companies" which I believe offer greater potential than the old stalwarts for generating investment returns. You can learn more about this new service which will debut next week .